November 16, 2017 November 3, 2017 by Beau H.
Classic, easily wearable chinos made with great quality in mind — just add stylish leather boots and other essentials for cold weather. Another day, another stellar product from Taylor Stitch — is it boring when a menswear brand is this great? Not in the slightest, my friends. In fact, the Taylor Stitch Slim Chinos in British Khaki are as good as it gets when it comes to an everyday pair of classic men’s chinos. Ya dig? Good, ‘cuz you’re in for a heck of a ride today on The Style Guide. If you’re not familiar with the work being done by San Fran-based Taylor Stitch, fear not — the brand just knows how to make quality men’s style essentials. The brand’s rather-famous Slim Chinos are no exception. As it were, the Slim Chinos in British Khaki might be the best of the bunch, featuring a rich color, excellent fabric and the type of versatile styling potential that works with stylish men’s dress shoes and a chambray shirt or a rugged crewneck sweater and classic leather sneakers in equal measure. Oh, and more casually rugged pieces like a Taylor Stitch henley? The Slim Chinos in British Khaki will work there, too. They feature a tailored fit that’s not too tight — a crucial first step in finding that perfect pair of chinos — and all the customary touches one expects from Taylor Stitch. We’re talking a 9.5oz. brushed Spanish twill fabric in a rich color that’s going to look great with a shawl-collar cardigan and rugged tan leather boots on cool fall days. And the real kicker? Taylor Stitch has made these slim chinos with cool details like vintage map pocketing featuring the brand’s home town of San Francisco. How neat is that? Quite neat. The Taylor Stitch Slim Chinos in British Khaki aren’t your father’s khakis, that much is true. Cut slim and without pleats, they’re easily wearable with all your favorite fall and winter style essentials, and in plenty of different situations. Thanksgiving, a fall trip, a weekend with the family or a busy day at the office … yes indeed, the Taylor Stitch Slim Chinos in British Khaki are the pair to buy now. If I didn’t know any better, I’d say they were among the best men’s chinos out there. But you’ll have to see for yourself. Are the Taylor Stitch Slim Chinos in British Khaki making their way into your shopping cart? Let me know in the comments! November 2, 2017 October 4, 2017 by Beau H.
A finely crafted pair of chinos available for a solid price from Grayers. There’s never a wrong time or place to wear a pair of classic men’s chinos, right? Particularly when that pair of chinos just happens to be the Grayers Newport Chinos, yes? Yes, indeed. Whether in the middle of fall, early winter, late spring or late summer, stylish men’s chinos just work when it comes to men’s style essentials — and that’s good enough for another entry in our ongoing See Now, Buy Now series as we move into November. With their roots in post-war functionality — G.I.’s wore chinos en masse after World War II upon returning home to the States — the classic chino features durable cotton fabric and a neutral tan (khaki) color, kind of like the Grayers Newport Chinos you see here. So, there’s a bit of #menswear history to go with the stellar, easily wearable style you get from Grayers. The brand does a nice job taking classic staples and making them cool and casual; in this case, that means the Grayers Newport Chinos fit nicely and move well, thanks to the cotton-elastane blend. And helpfully, that should make the Newport Chinos the ideal pair of pants to wear for your next fall road trip — or just your next day at the office. Simply sharpen up your look with stylish men’s dress shoes and an American-made Oxford, my friends. With a simple-yet-crisp design and a slim fit (plus plenty of sizes available as of post time), the Grayers Newport Chinos are a reliably stylish addition to many a fall (and winter!) style ensemble. Wear them to your next tailgate with one of fall’s best jackets — just add stylish leather sneakers — or take them for a spin with a striped henley, a rugged denim trucker jacket and the Wolverine 1000 Mile Boots. Keep them on hand to wear with a rugged shawl-collar cardigan and a classic indigo shirt jacket, too. The hearty construction and durability of the Grayers Newport Chinos lends this pair to repeated wear through winter, too. Your favorite topcoat and a classic cold-weather blazer are the perfect foil to an easily wearable pair of stylish men’s chinos — at least, your Style Guide author thinks so. Let me know in the comments — how many pairs of stylish men’s chinos do you own? Will you be doubling down with the Grayers Newport Chinos this season? January 2, 2017 January 9, 2017 by Beau H.
Looking ahead to another year in the concrete jungle — in style, of course. Suit by Alan David Custom. Shirt by Twillory. Tie and pocket square by Ties.com. Glasses by Frameri. Here we sit, just two days into 2017 — are you ready to talk men’s style resolutions for this year, yet? I sure hope so, because it’s topic number one today on the blog. Talking style resolutions definitely plays into a larger approach when it comes to ways to better yourself personally in the new year — be it picking up a new workout plan, saving more money or setting a resolution to get out and travel in style, there are lots of things to focus on in these early days of January. While I very likely can’t help you save money all that well — just look at my menswear wish list — we can work together to set some neat and achievable style resolutions. You dig? Good. So, I’d love to hear from y’all — what are your menswear resolutions this coming year? I set some rather lofty ones last year, including a goal to wear less blue and suit up more. At the end of the year, I have to say … I flubbed those goals a tad. Truth be told, I realized the color blue was an essential piece in my wardrobe, from layering up with a slim henley all the way through to wearing classic suiting with a denim shirt. So, I’m going to aim to work more color into more wardrobe, for one. And, partially thanks to my recent membership in the very cool Ties.com StyleGuruSociety, I’m going to aim to suit up more this coming year — once again, the bar is set high. And with my a lovely new, custom-made suit done beautifully by the team at Alan David Custom, it should be that much easier. Seriously, I can’t recommend the quality of their work enough — it’s classic, customized tailoring just as you prefer it. But, back to those resolutions. Whether your resolutions involve developing a classic menswear wardrobe filled with versatile staples or simply saving up to buy the coveted Bond Peacoat, I’m here to help. From this site’s ongoing #OOTD series to menswear style suggestions galore, we’ll keep the fun going all year long. So, here are my 2017 style resolutions — What are yours?? Let’s here ’em in the comments or via The Style Guide Facebook page. #1. Mix-and-match tailoring & patterns more. A fine example of how to mix patterns in tailoring — a pindot tie and two sizes of stripes. Pattern-mixing in the menswear world, particularly when it comes to refined tailoring. is a bit of a tricky art to master, but it’s a style skill that plenty of guys out there have honed. Exhibit A above comes to you as styled in the pages of Esquire — seriously, check out some standout shots of Michael Fassbender for a great example of how it’s done. It’s simple enough in practice — mixing, say, a large plaid poplin shirt with a smaller plaid wool tie, for example, or a striped tie with a patterned shirt. These are the sorts of combinations I’m aiming to try soon — follow along on Instagram to see how it works out. #2. Ditch those boots …. some of the time. An argument to be made for ditching the boots? Perhaps. Cole Bomber Jacket by Beckett Simonon. Cove Shirt by Life/After/Denim. Flat Black Selvedge by Todd Shelton. miUSA 585 Sneakers by Danner x New Balance. Waterbury Chrono by Timex x Red Wing Heritage. Glasses by Frameri. If you follow along with The Style Guide on a regular basis — as you well should — you’ll see that your SG team (of one) frequently wears and posts about stylish leather boots. Be it a tough workboot like the Original Chippewa Service Boot or something a tad more refined like the Astorflex Chelsea Boot, there’s no question that a great pair can be a year-round workhorse if you style ’em the right way. However, as much as I love my suede chukka boots, and a plethora of other styles, I’m feeling the need to break out classic staples like white leather sneakers far more often — and maybe with combinations like a blazer and a slim blue chambray shirt, at that. Are you with me? #3. 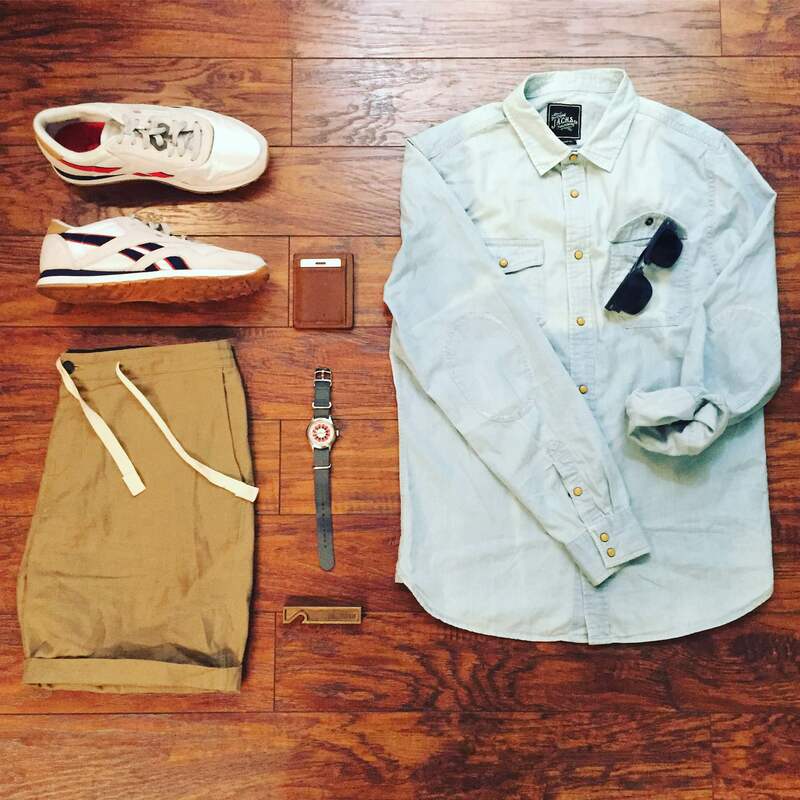 Switch those jeans for chinos … every so often. Just counting down the days ’til I can start wearing jeans again — I suppose? Button Denim Jacket c/o Forever21Men. Bowie Fit Chinos by JACHS NY. Sweater by Dockers. Classic White Oxford by Todd Shelton. Grounder Hi-Tops by Todd Snyder + P.F. Flyers. Mod Watch by Timex x Todd Snyder. Glasses by Frameri. My third and final major style resolution is something I took on last year — namely, wearing classic dark denim a bit less, and wearing versatile pieces like slim cotton chinos more. The slim cotton chino really is a four-season staple, and brands like Taylor Stitch know how to make them with the best brands around — so my affinity for the classic staple certainly provides a strong starting point. Don’t get me wrong, I certainly love the chinos I’ve got in my rotation, but I find myself reaching for inky blue denim more than, say, equally versatile olive chinos. With that in mind, I’m looking to participate in the #NoJeansJanuary challenge from the fantastic team at Style Girlfriend — will you be joining me? And I’ll be making more of an effort to swap chinos into my #OOTD this winter, too. Of course, the above items are but three resolutions I’ve got on my list — I’m also setting small workout goals, like knocking out sets of push-ups every day, and aiming to do other little things, like upgrade my apartment décor (if that’s a goal for you as well, check out what the folks at Friday & River have to say). What do you think of the above resolutions? Do they jive with any of yours? Let’s chat menswear on Twitter, and let’s kick off this year in style! September 26, 2016 October 14, 2016 by Beau H.
Editor’s note: Click through this link to read more personal style posts. From the office to a Central Park concert. Chambray shirt by Old Navy. Garment-dyed chinos by Dockers. Leather chukka boots by Beckett Simonon. Runaway Aviators by MVMT Watches. Weekender Fairfield Watch by Timex. Slim Mailbag by Satchel & Page. It’s hard to believe that September is very nearly in the books — and of course, we’re now officially into fall. And coincidentally, that brought with an ever-so-slight change in seasons this past weekend at The Style Guide HQ and elsewhere. While I’ve appreciated the chance to travel so much these past few months — from a Michigan wedding to a Labor Day trip to Asbury Park — the slight shift toward fall made me glad to be in New York City this past weekend; it wasn’t quite any regular weekend though, as it kicked off with a stellar concert by the amazing indie pop band Lucius, and rolled into beautiful weather and the chance to explore Brooklyn. Although I left my trusty Owen & Fred weekender bag behind, I still met the past few days with quality #menswear top of mind. The weekend kicked off in rather unique fashion — although I headed into the office to cap off a busy week in fashion PR, I had to dress in versatile style. Of course, that goes without saying — but as I trekked from the office up to Central Park thereafter for a stellar Lucius concert via the Central Park SummerStage series, it was particularly important. I hauled my gear in my trusty Satchel & Page Slim Mailbag — handy for getting to and from the office. I also reached for a slim-fitting, textured Old Navy chambray shirt — it was the ideal weight for temperatures that were quite hot, but not sweltering (like the weather during my summer Las Vegas trip). A chambray shirt is a great four-season essential, especially at a very agreeable price — and it teamed nicely with my Dockers garment-dyed chinos for an upgraded casual Friday look. This particular pair of Dockers chinos fit slim and are made of substantial, durable (yet breathable) fabric — again, a great four-season essential. And on the footwear front, I stuck with stylish leather chukka boots from Beckett Simonon — much like the slim chambray shirt, they’re the rare pair of footwear that can go from the office to a concert in one move. Although the brand has dress shoes for sale right now, I’d keep an eye out for future releases — these chukkas are comfortable, super and unique, thanks to the three-eye laces and sleek silhouette. I accented those essentials with another reliable casual accessory — my Timex Weekender Fairfield ; it’s a crisp, classic and subtle timepiece that moved from office to concert just as easily thanks to the slate green NATO strap. And what a show it was! An otherworldly performance from Lucius — and a privilege to be so close to the stage. Lucius is certainly one of my favorite bands — the melodic five-piece always puts on a stellar show. I was fortunate enough to be able to travel upstate earlier this summer to see them in at the rustic Daryl’s House Club in Pawling, and this time around, the show was certainly just as thrilling. Having the chance to get very close to the stage certainly made it all the more poignant – Lucius excels when they connect with a crowd. Led by the lovely Jess Wolfe and Holly Laessig, nearly every song is a sight to behold — their voices just play that well off each other. It’s a show of their dedication that they work so well together — from the moment they kicked off the show with “Go Home,” the magic really never stopped. They’re a group with great variety in their setlist — you get the feeling that they could play either “Wildewoman,” their 2013 debut, or “Good Grief,” this year’s sophomore album, in its entirety and fans would enjoy it just as much. An encore even brought out the legendary Jackson Browne, who joined Holly and Jess on a version of “Willin’,” an unexpected and welcome surprise! The rest of the show was just as much of a treat for fans. From carefully composed tracks like the beautifully sung “Dusty Trails” and “How Loud Your Heart Gets,” to the jaunty “Almost Makes Me Wish for Rain” and brand-new track “Pulling Teeth,” (which brought Holly and Jess into the crowd), Lucius never missed a note. The fact that they can transition from an upbeat sing-along like “Born Again Teen” to the lilting, haunting melody of “Gone Insane” within the same show is a testament to their versatility and skill — seriously, support this band if ever they tour near you! I can’t recommend them enough — and with a packed crowd on hand, I’m glad I had those durable Beckett Simonon chukkas to help my feet stay comfortable through the concert; all that jockeying for position (not a mosh pit, but still) lent itself to plenty of time on my feet. 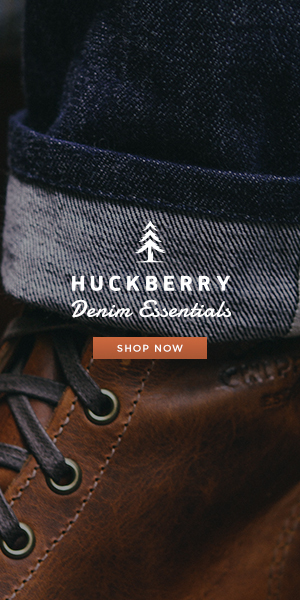 Rugged essentials for a slight transition to fall. Flint Overshirt and Flat Wool Cap by Bridge & Burn. Kramer Sneakers by UGG for Men. Waterbury Chrono from the Timex x Red Wing Heritage collab. Brass bottle opener by Owen & Fred. Again, it was a truly thrilling show that kicked off a stellar weekend — despite a terrible home loss by my beloved Michigan State Spartans to Wisconsin. Admittedly, that put a damper on an otherwise beautiful Saturday that brought with it exciting freelance writing work — more details on that soon — and some exploration of Prospect Park, to boot. As the weather finally felt a bit more fall-like (especially with a cool breeze), I was able to break out the rugged, well-crafted Flint Overshirt from Bridge and Burn. The overshirt is substantial but not too heavy, dyed with rich indigo and lined in soft plaid flannel. It’s just about everything you could ask for in a rugged fall overshirt, and with a slimmer fit than bulky, workwear-style overshirts of years past, it’s a decidedly modern style upgrade. Although it would pair up nicely with a slim henley, I styled it with a lightweight Richer Poorer pocket tee – it’s a soft, slim-fitting basic that every guy should have in his wardrobe for transitional layering. That simple get-up was complemented with sturdy selvedge denim from Raleigh Denim Workshop. Featuring a tapered cut through the thigh and a slim-straight fit from the knee down, they fit the way sturdy denim should fit – and so far, they’ve broken in quite nicely. To cap off my Saturday look, I had to reach for my ever-present Frameri glasses, plus the versatile Kramer leather sneaker from UGG For Men. With the cut of a chukka boot plus a nice rich color, they broke up the deep blue hues of the outfit nicely – and they fit right in with the rugged Red Wing leather on my Waterbury Chrono (another essential that plays nicely off the more substantial textures of early fall). Exploring Prospect Park on an ideal September weekend. Flint Overshirt and Flat Wool Cap by Bridge & Burn. Heather Grey Pocket Tee by Richer Poorer. Glasses by Frameri. Waterbury Chrono from the Timex x Red Wing collab. When it comes down to accessories, I also love a great hat – keep in mind, we’re not talking an athletic logo ballcap, but a subtle, simple wool cap (also from Bridge & Burn). If you’re into hats and want one that eschews the younger look of a logo ballcap, this one is the way to go. That ensemble made it easy to head to Prospect Park for some exploration and time spent in the sun. It’s one of my favorite areas in Brooklyn, with wooded pathways and access to neat areas nearby (like the excellent Midwood Flats, a craft beer haven with nice gourmet burgers and sandwiches). It’s also an area that’s quickly becoming more popular, with plenty of development nearby – yet, the park hasn’t lost its charm. Casual Sunday style for a trip to Milk & Honey in Brooklyn. Denim jacket by American Apparel. Slim short-sleeve henley by Old Navy. Slim Mercer Denim by Mott & Bow. Sunglasses & brown leather watch by MVMT Watches. Leather chukka boots by Beckett Simonon. Blue weekender bag by Sword & Plough. I took the opportunity on Sunday to enjoy some excellent weather around Brooklyn – no overshirt needed this time, although I did accessorize with a tough denim jacket. The pleasant weather meant it was the ideal chance to break out a slim short-sleeve Old Navy henley — while it’s still warm enough. If you want to upgrade your basics wardrobe with pieces that fit trim and won’t break the bank, definitely peruse the digital pages of Old Navy. Although we’re past Labor Day, I’ve found light tan or natural denim, like the trusty Mott & Bow Slim Mercer, nods toward white jeans without going too far down that path — the Mercer was a nice change of pace alongside crisp Beckett Simonon chukkas. The ensemble was complemented nicely by some patterned Richer Poorer socks — a pair or two from the brand is another purchase worth making if you need a sock upgrade. Easygoing accessories worked with this look, too. I’d definitely recommend taking a look at new sunglasses –like the Runaway Aviator – being produced by MVMT Watches. Of course, the excellent brown leather & rose gold watch seen here from the brand is also worth your time – pun intended. 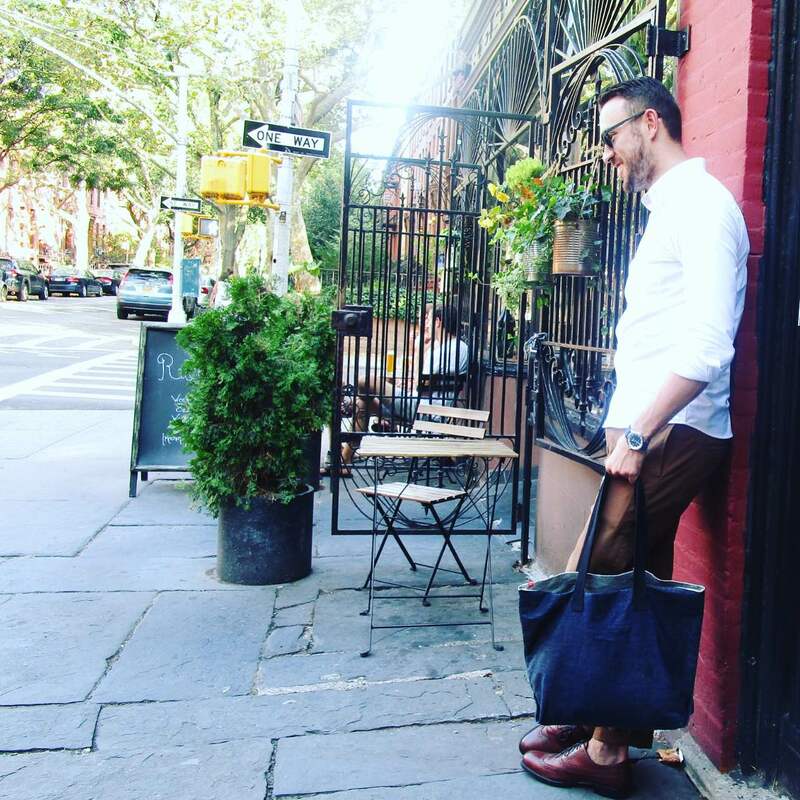 Each piece made for a laidback #menswear look fit in as I grabbed a delicious coffee at another perennial Brooklyn favorite, Milk and Honey. With a relaxed vibe, rustic wooden tables and a top-notch selection of pastries and brunch favorites, it’s worth a walk through the Ditmas Park neighborhood to get there. It’s the small pleasures like a delicious coffee or a nice walk that can sometimes get lost in the bustle of New York City – so with that in mind, I was glad I took the opportunity to get out and explore this weekend in Brooklyn. It never hurts to start off your Friday night with a stellar show by Lucius, either! I’ll be counting the days until the band returns to my neck of the woods, and I’ll (hopefully) be dressing in style in the meantime. If you have style questions of your own, hit me up on Twitter – or follow along on Instagram for daily #menswear inspiration. For now, it’s back to work — look for a special Style Q&A coming up on Wednesday, and circle back tomorrow for a look at a fall style #OOTD. Get it? Got it? Good. September 5, 2016 October 15, 2016 by Beau H.
Editor’s note: Click here to follow along with more travel style posts. Searching high and low for cool sights in Asbury Park. Denim Shirt by JACHS NY. Stringer Dune Shorts by Bridge & Burn. Daily Classic Nylon Sneakers by Reebox x JackThreads. Mod Watch by Timex x Todd Snyder. Sunglasses by Nautica. Flat Wool Cap by Bridge & Burn. It’s no surprise that given how much I’ve been on the road in the past month, the summer came to quite the quick end. But that didn’t stop me from squeezing in one last long weekend of fun before summer (technically) drew to a close. Just a few days after I returned from a summer vacation in Florida, I set my sights on having some fun over the long holiday weekend — as I did for a Memorial Day weekend road trip to kick off the summer. Perhaps you also hit the road, if only for a day or two. That was the case for me, as I took full advantage of a day off on Monday and used the rest of the weekend to hit up everything from my favorite #menswear shops in NYC to the stylish, up-and-coming locale of Asbury Park (all the way down in New Jersey) on a fine September Saturday. And lest we forget, it was a boisterous opening weekend in college football — and that brought with it the chance to cheer on my Michigan State Spartans in style (as you can see below). So, follow along as I recap a weekend that brought with it a little of everything. If you should happen to get bored, check out more menswear musings on Twitter. A vintage-inspired Tailgate Clothing tee and a tough team watch from Jack Mason help add a touch of style to an athletics-inspired outfit. Army Issue Sneakers by SeaVees. Slim Mercer Light Denim by Mott & Bow. Brass bottle opener by Owen & Fred. The weekend started slightly earlier than normal thanks to my day job’s advantageous Summer Friday policy — gotta love a few extra hours off. That meant I had plenty of time to rest up for a night of cheering on my alma mater, Michigan State, as they kicked off what should be an excellent college football season with a solid (not stellar) win against Furman. I had some help from my friends at Tailgate Clothing and Jack Mason, who were kind enough to hook me up with team-appropriate gear for the occasion. 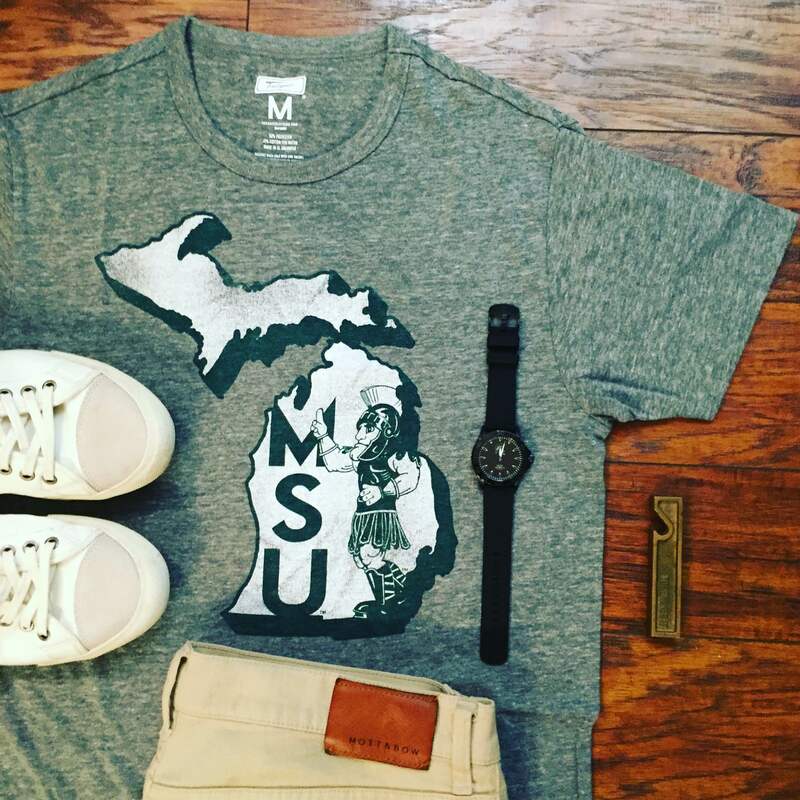 Both available for great deals, I’d seriously recommend the excellent Michigan State Spartans T-shirt and the Blackout Silicone Strap Watch seen above if you happen to be a Spartan fan — and if not, either brand stocks a bevy of stylish college gear made with everyday good looks in mind. I complemented those new favorites with another style staple, my reliable-as-ever Mott & Bow Slim Mercer Light Denim; it’s a perfect change of pace from trusty dark denim. On the footwear front, the SeaVees Army Issue Sneaker (sold out in White but available in a similarly neutral Olive) was comfortable, effective and appropriate in terms of color (Go White, am I right?). Although I’ll have to add a few layers as the weather gets colder, I can tell my team watch and vintage-inspired tee will provide ample school spirit — and style — all throughout the season. An outstanding Spartan victory on Friday night paved the way for an outstanding start to the long weekend. For me, that meant a Saturday morning train ride out to the bustling, up-and-coming locale of Asbury Park, an oceanfront New Jersey haven a little over an hour from New York City. Known for a burgeoning arts scene and prime beach vistas mixed with modern touches — like the newly opened Asbury Hotel — the city has done a nice job mixing the eclectic and the modern. That goes for a classic-yet-refined boardwalk, plus establishments like Dark City Brewing Company and more established locales like one-of-a-kind bar Johnny Mac (spoiler alert — those were two of my stops on the trip). 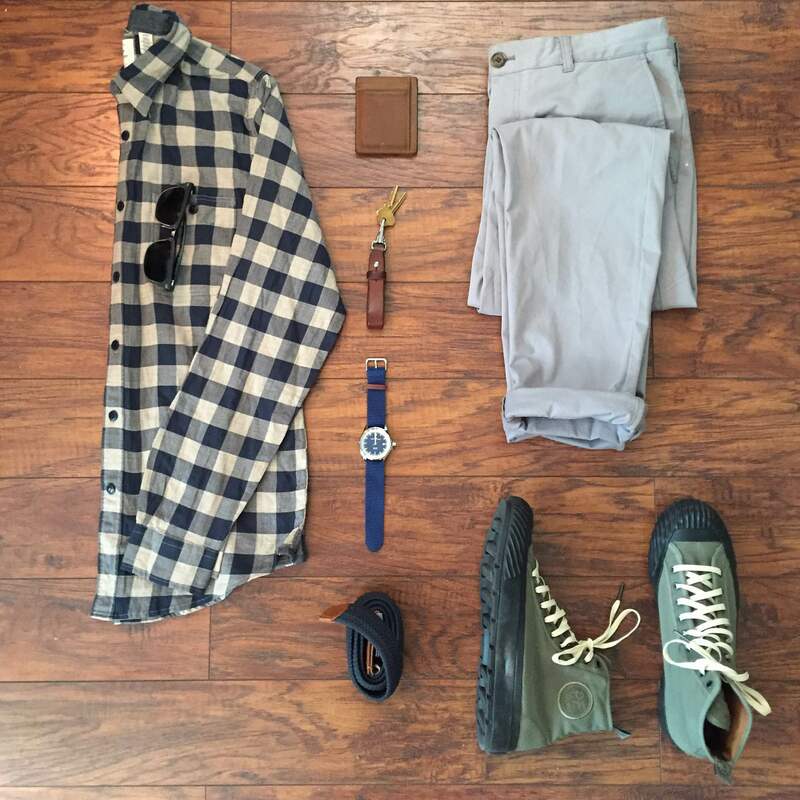 As the day called for casual style, I met the trip accordingly with pieces built for comfort, movement and good looks. Mixing retro-inspired kicks with lightweight summer classics. Denim Shirt by JACHS NY. Stringer Dune Shorts by Bridge & Burn. Daily Classic Nylon Sneakers from the Reebok x JackThreads collab. Mod Watch by Timex x Todd Snyder. Scout Wallet by Andar Wallets. Sunglasses by Nautica. It was a prime chance to break out a new favorite piece from JACHS NY, a vintage-inspired light wash denim shirt that offered a bit of stylish contrast to my laidback Bridge & Burn Stringer Dune Shorts. Note that the JACHS denim shirt is sold-out, but you can grab a reliable back-up via JackThreads. To combat the chance of rain and some cloudy skies, I threw on a stylish hooded parka from the Masafumi Watanabe for Reef collaboration. I also always appreciate the chance to rock some standout sneakers on trips long and short — my Reebok x JackThreads Daily Classic Nylon Sneakers have proven tremendously comfortable and stylish, and they were the perfect Saturday style pick. Although the day started out cloudy, skies eventually opened up as I explored a quickly developing downtown area (not far from the boardwalk, as it were). From stop to stop, I found that the Scout Wallet from Andar Wallets combined a slim profile with functionality, crucial for traveling light. And my Nautica sunglasses brought bit of retro edge — the navy Wayfarer style seen at the very top of the page is cool, unique and casual — but not too laidback. 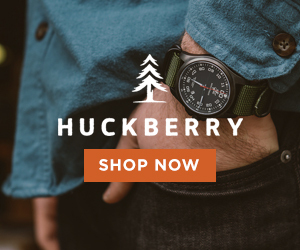 If you read this blog, you know I love me a great watch, and I certainly didn’t pass up a chance to wear my Timex x Todd Snyder Mod Watch, either. 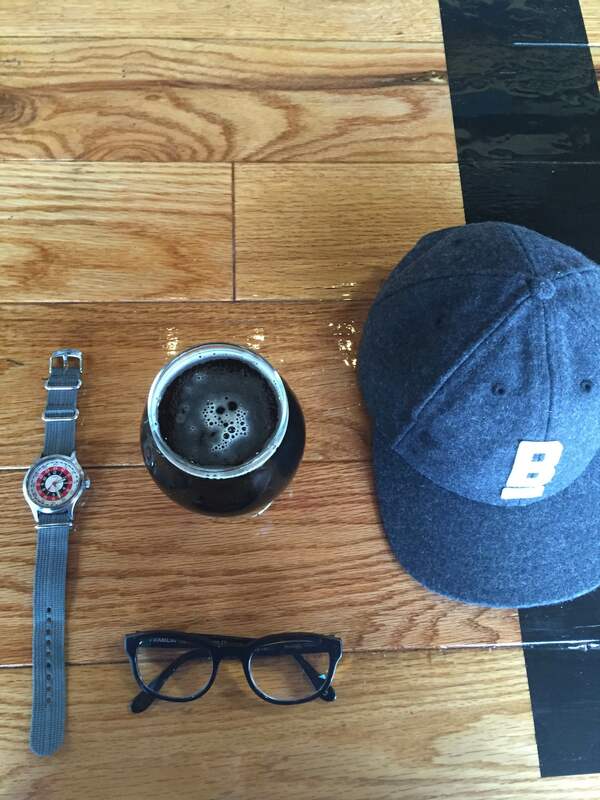 All the gear fit for grabbing a quick pint. Flat Wool Cap by Bridge & Burn. Mod Watch by Timex x Todd Snyder. Glasses by Frameri. Bond Street Brownie by Dark City Brewing Company. Those pieces definitely helped me get around Asbury Park in style, including stops at the aforementioned Dark City Brewing — you can’t go wrong with grabbing a tasty flight, but I’d certainly recommend the Bond Street Brownie, a rich, roasted brown ale. I followed up that stop with a lengthy stroll along the boardwalk and a quick pop-in to check out the stylish and sustainable Asbury Park outpost of United By Blue. The shop itself — and the brand — have definitely done a nice job mixing eco-friendly pieces with durable style . If you find yourself in need of a quick bite or an iced coffee, you can’t go wrong with a quick trip to High Voltage Coffee, located conveniently down the boardwalk from United By Blue. Although the weather was just a tad cloudy for parts of the day, I still had a heck of a time exploring what’s quickly becoming a haven for arts and culture — refurbished boardwalk buildings adorned with large murals are just one example of those efforts. And for those who like a cold brew with a side of outdoor relaxation, the unique Wonder Bar not too far from the boardwalk offered up a nice chance to soak in some rays, while Johnny Mac featured everything from vintage instruments to old records plastered on its packed walls (in addition to a solid selection of craft beer). No Sunday in Brooklyn is complete without a stop at Rucola. White Oxford by Todd Shelton. Premium Garment-Dyed Khakis by Dockers. Duvall Wingtips by Johnston & Murphy. Sunglasses by Nautica. Nautical 3-Hand Watch by Jack Mason Brand. Tote bag by JackThreads. I’ll definitely be back to Asbury Park, but yesterday brought a return to NYC and a relaxing Sunday featuring a little bit of everything. I’m a big fan of my Sunday brunch, as any reader of this blog knows, so I always relish the chance to fight the Brunch Village crowds — especially when it means a stop at one of my favorite Brooklyn spots, Rucola. It’s surrounded by quiet, tree-lined streets and lovely brownstones. On this particular Sunday, I went for sharp-yet-simple style (if you’ve got to head somewhere special right after brunch — say, to a matinee show — a similar combo might be the way to go). In this instance, that meant my Todd Shelton White Oxford was a crisp base for my ensemble, accented by a slim, stylish and comfortable pair of Dockers Premium Clean Garment-Dyed Khakis. Finding pieces that work in that transitional time between summer and fall is tough, but slim chinos in a rich, fall-ready color (like the Tobacco version seen here) are as good a pick as any. The chinos played nicely off the rich brown Johnston & Murphy Duvall Wingtip, and the entire combo would work well with a few minor adjustments throughout the rest of fall (namely, beneath a shawl cardigan when it’s chilly). Two reliable finishing touches helped me complete a look fit for brunch and Sunday adventures — my Wayfarer-inspired Nautica sunglasses and another Jack Mason timepiece (the Nautical 3-Hand Watch). They provided the perfect mix of refined, laidback style — for Sunday brunch, that combination is the way to go. With a delicious brunch as fuel for the day, I had more than enough time to take care of some writing for GearMoose and hit up a few of my favorite menswear establishments in Brooklyn, including the terrific lifestyle outpost that is Modern Anthology. 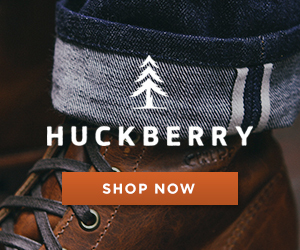 They carry a well-curated assortment of home goods, crisp-and-rugged furniture and essential menswear, plus other odds and ends you didn’t know you needed — give the Web store a look, will you? It’s definitely a favorite haunt in the city, and it made my Sunday all the more enjoyable, as did a stop for a refreshing iced coffee at Absolute Coffee in Boerum Hill — I love me a pit stop for a jolt of caffeine, and I love a rich cold brew even more. Even after all that weekend activity, my time off is still going — and I certainly planned ahead to enjoy Labor Day in style, starting with my Dockers Premium Wrinkle Slim-Fit Twill Shirt (as featured in this site’s Labor Day style suggestion). In this humble writer’s opinion, that comfortable, casual style carried right on through to my JACHS NY Bowie Fit Stretch Cotton Chino in a four-season shade of grey, plus the terrific, durable and unique Todd Snyder + P.F. Flyers Grounder Hi-Top sneakers. That particular collaboration is certainly one worth admiring — and buying — for its blend of heritage and modern styling, plus all-around great looks. I complemented the look with the Nautical 3-Hand Watch from Jack Mason — the rich blue dial and Perlon strap create a one-of-a-kind pop of blue that’s still nicely versatile with neutral staples (like grey chinos and a navy shirt, for instance). As to my plans for the day? Well, I’m looking forward to another delicious coffee at Milk & Honey — because old habits die hard. A trip to Prospect Park is likely in order as well — and of course, I’ll be busy reflecting on an outstanding Labor Day weekend in and around New York City, and looking forward to a busy fall season. Need more daily style inspiration? Hit me up on Instagram, and peruse the Search bar here for more stylish menswear. P.S. Check back here tomorrow for our weekly #OOTD post, and be on the lookout for a Fall Style Wish List coming soon.